FRIBOURG, SWITZERLAND--(Marketwire - February 2, 2011) - Westcore Europe, an affiliate of U.S.-based Westcore Properties, announces it has acquired a 10-story, 6,335 square meter (68,200 square feet) mixed-use building located at Rue St.-Pierre 6 in Fribourg, Switzerland. The transaction value is undisclosed. The company, which recently completed the acquisition of Satigny Business Park, in Geneva, Switzerland, continues to build its successful Swiss acquisition program with the purchase of the former downtown Fribourg department store. The building was leased to a variety of retail, leisure and office tenants by the former occupier and owner, Coop. Fribourg is a popular university town located 140 kilometers northeast of Geneva, with a population of 34,500, and sits on the border between the French and German speaking areas of Switzerland. "The property's proven track record of attracting and retaining tenants along with its premier location in the Central Business District of Fribourg, presented an excellent opportunity for acquisition," said Marc Brutten, founder and chairman of Westcore Properties. The building is comprised of retail, leisure and office accommodations, including a bowling alley, restaurant, and a variety of commercial office tenants. It is currently 85 percent leased. A night club in the building is currently vacant and available for lease. The lower ground floors also include storage areas and a 117-space car park. 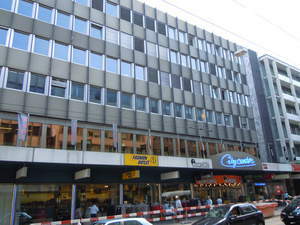 The building's location next to Fribourg Center, the city's largest shopping center, along with its close proximity to the train station and university campus sites, contributes to the project's strong appeal. Additionally, the building offers panoramic views of the surrounding mountains and countryside from its south side. "The spectacular views are an attractive feature of the building," said Michael Wolfson, vice president of acquisitions at Westcore Europe. "Tenants also value the project's central location and secure after-hours access," he said. Wolfson added that Westcore Europe has developed an extensive asset management plan which includes pursuing items of deferred maintenance, building service upgrades, restructuring service charges, tenant engineering, reconfiguration of space and improvements to building fabric. "Westcore Europe will aggressively engage in marketing vacant space available for lease in the building, and is already in negotiations with a variety of tenants to take up the remaining space," said Wolfson. The building, which includes tenants such as Fribowling, Voegele Clothing and Bulliard Immobilier, is elevator served and offers both tenant and public parking. Westcore Europe was represented by Labocom SA. The seller, Coop, was represented by KPMG. Westcore Europe reports that Gerama SA has been retained as leasing agent (+41 26 351 15 20). For additional information, please contact Marc Brutten, in the U.S. (mbrutten@westcore.net) or Michael Wolfson in Geneva (mwolfson@westcore.net). Westcore Europe LLC is an affiliate of Westcore Properties (www.westcore.net). Westcore Properties is a private, entrepreneurial commercial real estate investment firm with a specialized focus in the western United States and key European markets. Since its founding in 2000, the company and its affiliates have acquired and managed more than $3.9 billion in industrial and office assets comprised of 550 buildings totaling over 25 million square feet. In addition to its U.S. headquarters in San Diego, Calif., Westcore Properties has regional offices in San Francisco, Calif. and Denver, Colo. The firm's European offices are located in Geneva, Switzerland and London, England.